Recipes | Winter Squash-mmm so good! Squash is packed full of nutrients, most notably beta carotene, vitamin C, potassium, folic acid, fiber, and manganese. Beta carotenes help protect your child from the damaging effects of the sun. They also help fight against cancer, heart disease, and cataracts. In addition to the health benefits of squash, your little one is sure to devour it when prepared right. The flesh is sweet and creamy. My favorites are Butternut, Acorn, Spaghetti, and Delicatta. 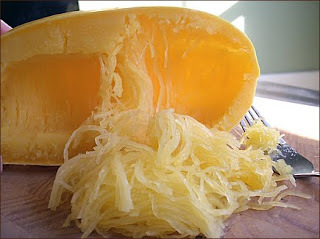 For an alternative to pasta, try spaghetti squash. Cook the same as above. When it is done, take a fork and “rake” the squash threads into a bowl. Add chopped spinach and marinara sauce. Pesto is DIVINE on spaghetti squash. The whole family will love it!! *It is important to note that the beta carotene in squash is fat soluble so in order to absorb it, you must pair it with a fat. So don’t skimp on the coconut oil/butter (1-2 tbsps).